As a B2B marketer, lead generation is key. Your target customers need a little more convincing when it comes to selling them on your products or services than someone selling t-shirts. Because of this, generating high-quality leads and nurturing them with email is a sound way to get more customers for your B2B business. Great – we have the formula, but how do we put it into practice? More specifically, how do we generate these leads in the first place? You’re likely already employing a few methods: maybe you’re running ads to landing pages, collecting leads through your blog, or booking product demos on your homepage. That’s awesome – those are all strategies that are sure to help your business generate quality leads. But in this article, I’m going to discuss a tool that’s often overlooked when it comes to B2B lead generation: exit popups. I know, I know. Popups – groan. Here’s the deal, exit popups have been proven to significantly decrease bounce rates and increase time-on-site. Say what you want about them, but exit popups might be just what you need to skyrocket your B2B lead generation.In this article, I’ll cover everything you need to get started generating B2B leads with exit popups. Let’s get started! There’s a 99.9% chance you’ve seen an exit popup before, especially as a B2B marketer. Unlike other types of popups (like entry or timed popups), exit popups appear based on user action. 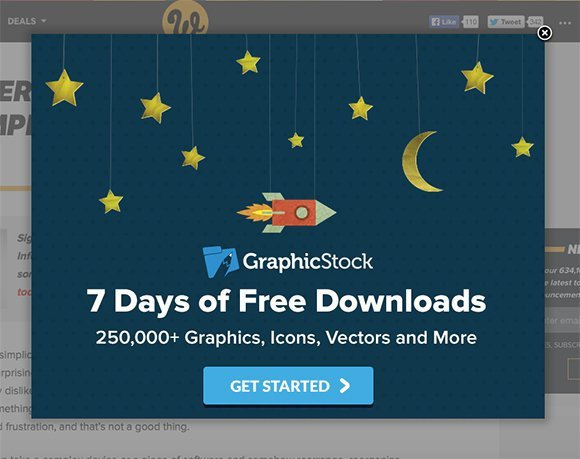 Another way to look at exit popups is as a “last-ditch effort” to capture a lead. They often differ from normal popups in their language (“Stop!”, “Wait!”, etc.) and present an offer to incentivise viewers to convert and provide their lead information. It’s easy for visitors on your website to become distracted or bored. Even if your pages are optimised for lead generation, there’s a variety of things that could pull their attention away, like a Facebook chat in another tab, or even a lack of interest in the content on your site. Exit popups re-focus viewer attention on your lead generation offer, whether that’s an email subscription or some sort of lead magnet, thus increasing the chances they’ll convert. Popups are so successful because they’re optimised to highlight your lead generation offer. They’re “lightboxed”, meaning they dim the rest of the window behind the popup, and they literally pop up, helping to pull attention by requiring a viewer to act (either by converting or exiting the popup). 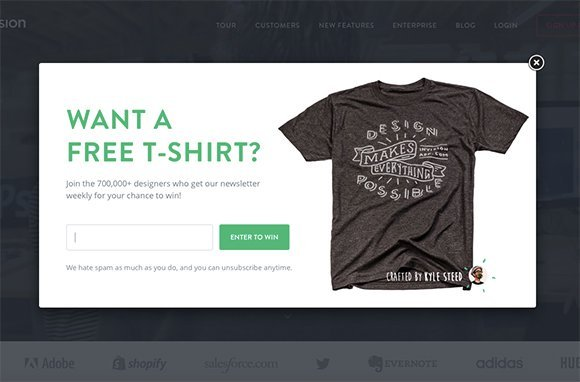 Compared to your website or landing page, a popup feels “exclusive”. Because they can’t be bookmarked or re-visited (unless they’re triggered on more than one page visit), they’re much more effective at getting people to act immediately. Conversely, visitors might bookmark your landing page and forget about it later – and that means you’ve lost a conversion. This is the essence of a highly-converting exit popup. 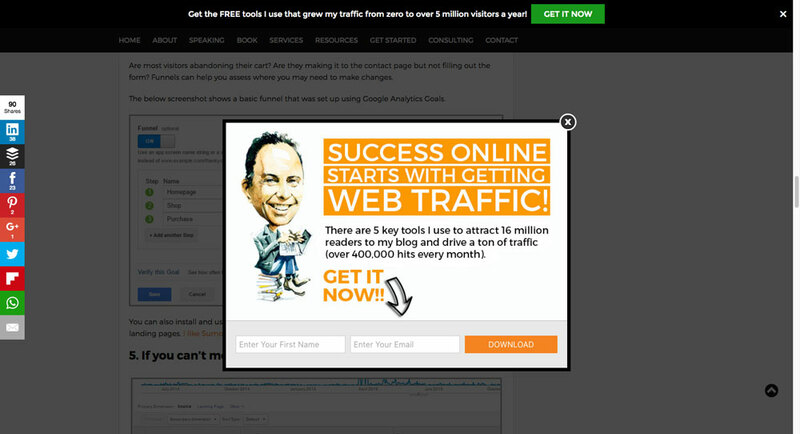 Having a strong offer (or lead magnet) can mean the difference between annoying and awesome for your exit popup. It’s really the heart of your popup – you’ll have trouble finding success without an offer that intrigues your visitors. Think about it from your visitor’s point of view. If your lead gen optimised website or landing page couldn’t get your visitor to convert, an exit popup simply reiterating what they’ve already read is unlikely to garner a conversion. You need something more enticing to incentivise converting on your popup and giving up their lead information. I mentioned previously, an exit popup is usually your last chance to capture lead information from a website visitor. 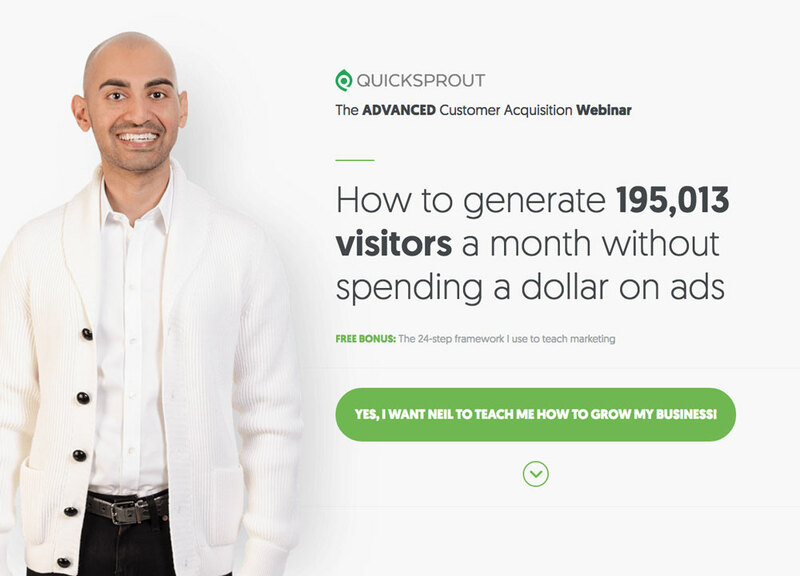 Once they’ve chosen not to convert on your exit popup, you’ve probably lost that visitor as a lead. So pull out all the stops (as far as is reasonable) to create a great offer and maximise the number of leads you generate. Free webinar: If hosting webinars is already a core part of your B2B marketing strategy, inviting a visitor who’s on their way out to join your next (live or pre-recorded) webinar might be just what they’re looking for. Relevant content upgrade: If your visitor is on a specific page, like a post on your blog or a product page for a specific tool, offering additional gated content that’s relevant to the page is an easy way to personalise lead gen efforts for topics we know our visitors are interested in. For example, I might offer “10 Awesome Exit popup Templates” as a content upgrade for this very article. 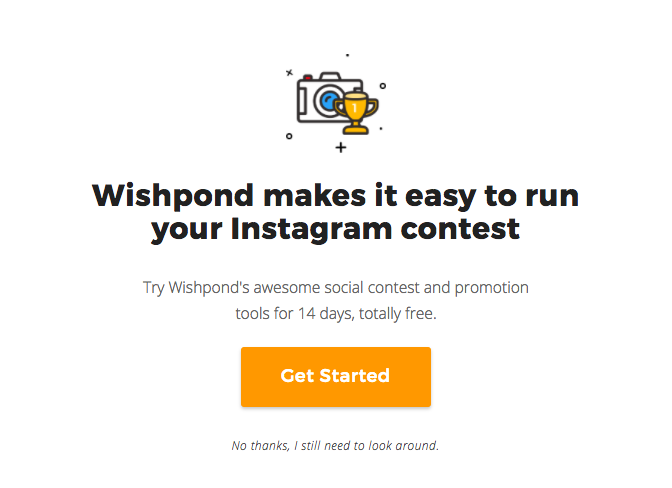 Contest entry: Running contests (like a sweepstakes or photo contest) is one of the best ways to generate leads – but that’s a topic for another time. Informing your page viewers of a contest you’re running and allowing them to enter right from the popup is an engaging offer with a lot of value for a visitor. E-book: Though it’s similar to a content upgrade, an e-book offers significantly more content – and more value – to a potential lead. Create an e-book covering topics relevant to your product (for example, The Ultimate Guide to Lead Generation for Small Businesses), and watch the leads roll in. Free trial: Chances are, if you have a B2B SaaS, you already offer some sort of free trial. Yet, drawing attention to it along with some words of reassurance (“no credit card necessary”, “no contract”, “try it FREE for 14 days”) can address some visitors’ uncertainty and help you get more leads. How do I create an exit popup? Though exit popups may have been virtually impossible for a non-code-savvy marketer to implement in the past, the marketing apps of today have made it simple for marketers to create popups from scratch. There are a variety of apps that you can use to create your exit popup, such as Wishpond and OptinMonster. Highlighting the benefit received by converting on your popup helps users see the value of your offer in a more concrete way. It highlights the “reward”, which is appealing to a potential lead. Examples of benefit-oriented CTAs include “Generate More Leads”, “Get My Free Templates”, or “Save 20%”. One of the most effective ways to convince visitors to convert on your popup is to show them that they’re not alone. Whether you name-drop a company you’ve worked with (“Get the [product] that Apple uses to…”) or highlight your many happy customers (“Join 123,456 other marketers like you”), showing visitors that others happily use your product or service can make a big difference in your conversion rates. This is really a CRO design best practice. A directional cue is a visual element that directs a viewer’s attention towards your conversion goal. This might be an arrow, or the eyes of the person in the image on your popup. This helps naturally draw your viewer’s eyes towards your offer or form, increasing the chance that they’ll convert on your popup. Giving visitors specific information about how your B2B product or service can benefit them is great – but it’s even better when you’ve got data to back it up. What’s more convincing: “get more leads for your business” or “see how we increase our customers’ conversion rates by 30%”? Using numbers or data – as long as they’re honest and accurate – goes a long way towards establishing credibility with potential customers. Invoking urgency is one of the best ways to get a potential lead to act on your offer. Implementing a countdown timer (even if it’s not a real one) is a great way to get people to convert now, rather than waiting to do so at a future time. It makes visitors think your offer may expire in the near future – and that’s not something they want to miss out on! Negative CTAs appeal to people’s desire to minimise losses. For example, a negative CTA on a content upgrade for a lead generation e-book might sound like “No, I don’t want to learn how to generate more leads”. It comes off as a little shady, but it’s proven to work – people don’t want to lose out on the offer (especially when they need to explicitly reject it), so they convert. Including a progress bar on your popup makes viewers feel like they’ve already made it part of the way to claiming your offer – they may as well do the rest. 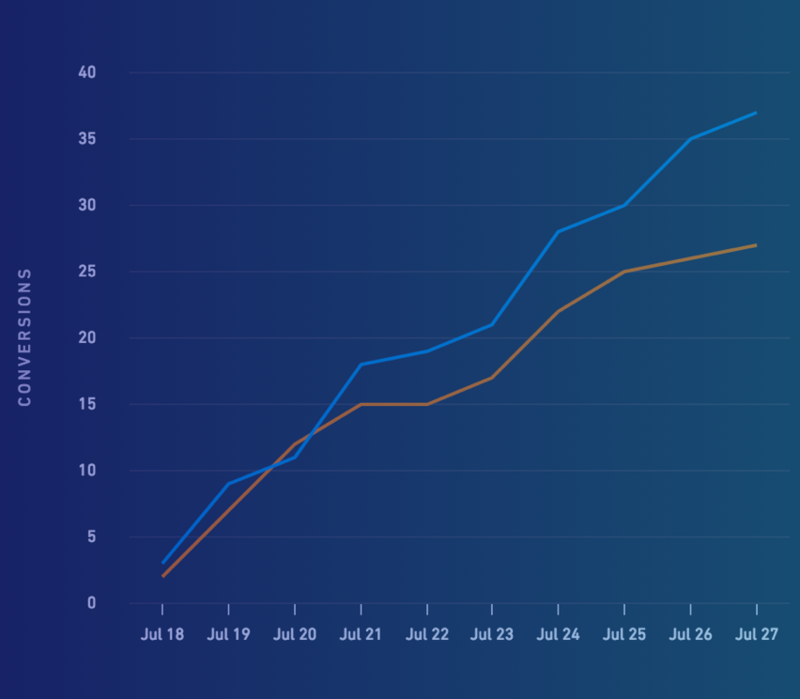 People don’t like to leave things incomplete, so including a progress bar that shows your visitor there’s only one step left to receive your offer can increase conversions. Show your visitors that your business is the real deal by displaying any awards or accolades you may have received. This helps reduce uncertainty (especially when they’re from credible sources), increasing the chance that a viewer will convert on your popup. That being said, stay away from mentioning any awards from low-credibility sources – this just makes your B2B business look sketchy. There you have it – a complete guide on using exit popups to generate B2B leads for your business. Though I’ve included a bunch of ideas and best practices, remember that it’s in your best interest to test everything to find out what works best for you. 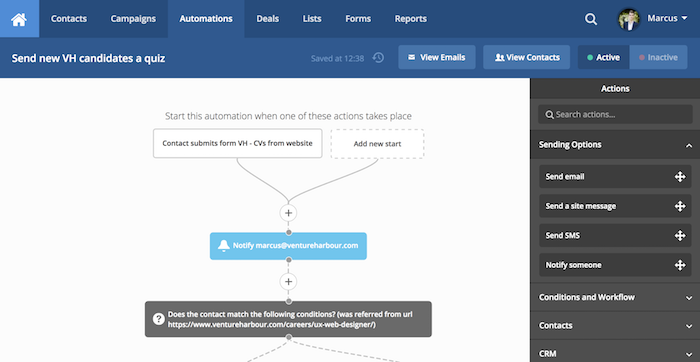 When it comes to lead generation for B2B businesses, exit popups are one of my favourite tools. They’re easy to set up, simple to design, and have proven time and time again that they’re one of the most impactful ways you can optimise your B2B lead generation efforts. I hope this guide gave you some great ideas for your exit popup efforts, whether you’re just starting out or you’ve been using them for a while. Try these ideas out for yourself, and you’ll see just how awesome exit popups can be for your B2B business.